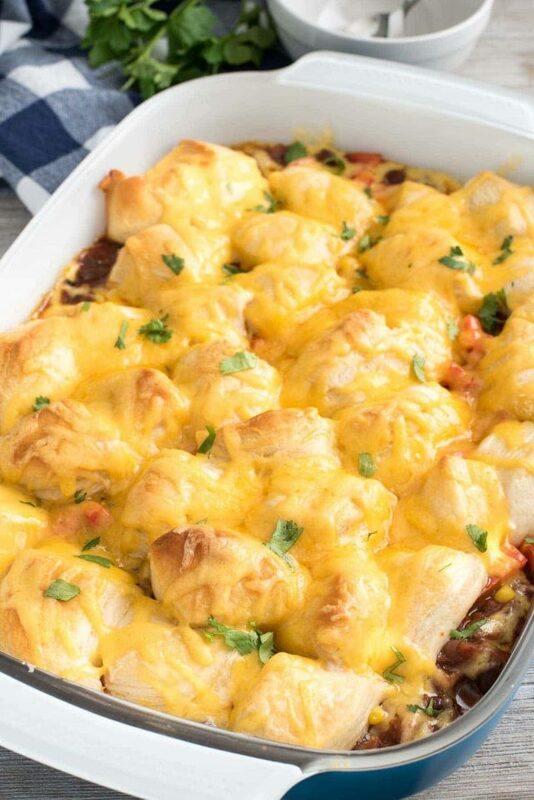 One Pot Taco Casserole is an easy weeknight meal! It’s the perfect amount of spicy with ground turkey, chili beans, taco seasoning, and lots of cheese! We loved this meal and we ate it for leftovers with chips as a dip. It’s finally September and that means two things: it’s my birthday month and it’s FINALLY starting to feel like fall. We may be still sweating in tanks and shorts here in Sacramento but at least the mornings are getting cooler and the days are getting longer. If I make fall food, maybe actual fall will finally hit Northern California. When I think of fall food, I think abut casseroles and comfort. With cooler temps and busier days because of our dance schedule and school and our new puppy, I am having a hard time getting dinner on the table each night. I feel like all of a sudden it’s 5:00 and I don’t have a plan! That’s why I need an arsenal of easy, fast, and delicious 30-minute meals to pull out of my back pocket. When it’s last minute dinner time and I don’t know what to make, I fall back on two things: tacos and pasta. Both are fast and easy and who doesn’t love either one of those? 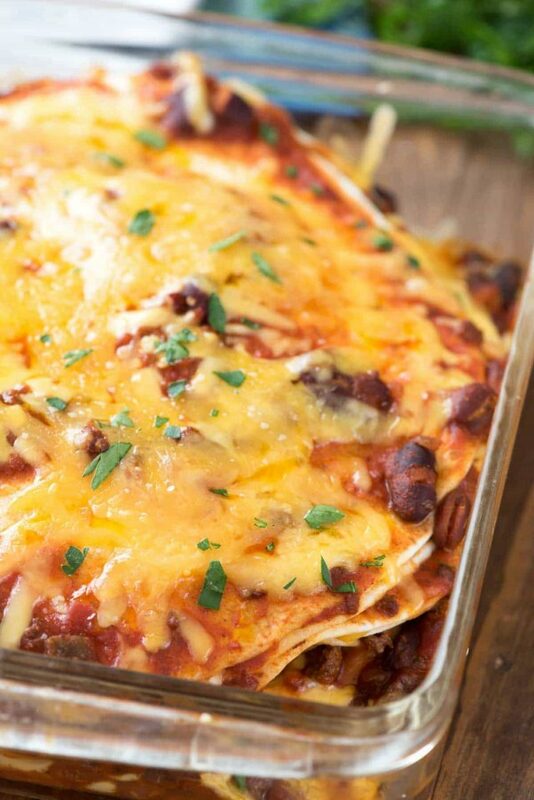 There isn’t anything easier than this taco casserole; it’s full of meat and beans and veggies and CHEESE and is the perfect fast weeknight meal (or leftover snack). Plus, you don’t need any additional carbs like tortillas or rice; this meal is satisfying all on it’s own. 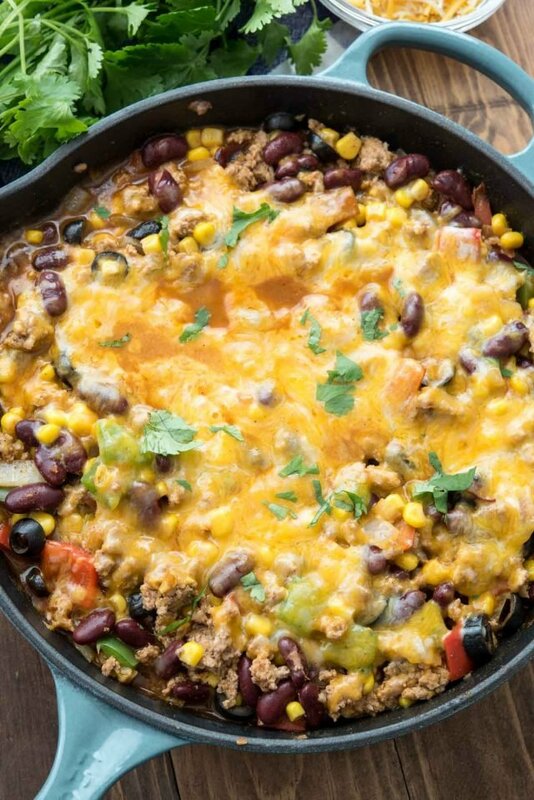 Ready in under 30 minutes, this One Pot Taco Casserole is an easy meal perfect for weeknights and even a pot-luck! One pot meals are some of the best, don’t you think? This casserole is layered in a large skillet and done all on the stovetop. You don’t even need to turn on your oven! Simply brown up the ground turkey (you can also use ground beef but I like making it a little more feel-good by using turkey instead). Cook the peppers and onions in the turkey, then add the beans and seasoning. The last step is to add the corn and cheese on top. Everything is better with cheese! Have I ever told you guys about how I’m obsessed with beans? Seriously: I love them. Bean burritos, beans on salad, beans in chili, black bean hummus…I love them. They’re regularly a staple in my grocery cart and on my dinner table. Of course, when you’re buying beans, you want to buy the ones that are the best. I have always loved BUSH’S® Beans, from the time when I lived on baked beans as a kid to now when I throw kidney beans on my salads. Of course, when making a Mexican casserole, one must add beans! BUSH’S® Kidney Beans in Mild Chili Sauce are the perfect accompaniment to this dish, adding some texture to the ground turkey and spice to the taco seasoning. Feel free to use your favorite beans in this dish; BUSH’S® has Kidney Beans, Black Beans, and Pinto Beans all that come in a mild chili sauce. If you want it spicier, you can even try their new beans in a spicy chili sauce. I’m using that next time because my husband LOVES his meals extra spicy! Use your favorite flavor BUSH’S® Beans in Mild Chili Sauce (Pinto, Kidney, or Black Bean). For an extra kick, use the new beans in Spicy Chili Sauce. Any color bell pepper works, I just love using red and green because the colors pop with the yellow of the corn and black of the olives. Mix and match your favorite Mexican style cheeses. The casserole is a meal in itself and is done in under 30 minutes! This easy dinner recipe makes a ton, so leftovers are perfect for lunch the next day. Serve with tortillas or eat with chips like nachos! If you don’t want to use a packaged taco seasoning, use a DIY Taco Seasoning instead. 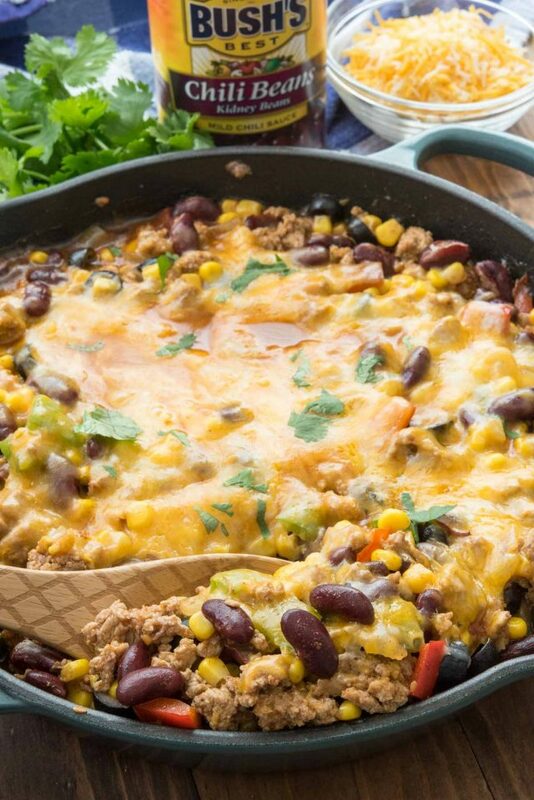 One Pot Taco Casserole is an easy weeknight meal! It's the perfect amount of spicy with ground turkey, chili beans, taco seasoning, and lots of cheese! The leftovers are perfect as a dip with chips or in tortillas as tacos! In a large 12-in skillet, cook ground turkey, onion, and peppers over medium-high heat until turkey is no longer pink. Drain fat. Add taco seasoning, and beans (with their liquid) to the pan. Stir to combine. Simmer, stirring occasionally, for about 5 minutes. Stir in corn and olives, cook another 1 minute. Top with shredded cheese and then cover the pan with a lid to allow the cheese to melt. Serve hot. Store leftovers in an airtight container in the refrigerator for up to 2 days. Leftovers are good in tortillas as tacos or served with chips as a dip. Sounds great; when is dinner? The more ways I can eat tacos, the better- and this version looks AMAZING! Totally loving how simple and easy it is too! Ooooh one-pot tacos…love it! I can’t believe your daughter doesn’t like either tacos or pasta – those are go-tos for my kids! Good luck, mama! How many tsp or tbsp or ounces of taco seasoning are in a packet? I use a bulk qty. rather than a pkg as it is way cheaper. Made it for dinner.My girls and I loved it! You are right. This recipe makes a lot. Can’t wait for lunch tomorrow. BTW, I have four girls. Thanks a million for this easy, tasty recipe. The instructions say to add water, but water isn’t on the ingredient list. How much needs to be added? I have a recipe I use to make my own taco seasoning, so don’t have a seasoning packet with instructions for adding water (I assume that’s the water the instructions are referring to). Tried it. Loved it! I had the same issue with water because I didn’t use a package taco seasoning either. I tried adding 1/4 cup of water to the recipe and it seemed to be enough. Only change I would make next time is to try using Trader Joe’s frozen roasted corn for a deeper corn flavor. I thought the canned corn was bland.